Things are...complicated in Daredevil season 3. As the first of Netflix’s Marvel shows to reach its third season, Daredevil has the unique challenge of telling a story that’s reflective of the journey its characters have been on since we first met them. It also has to feel fresh, exciting, and worth a return visit to Hell’s Kitchen. Daredevil season 3 does that impressively by adapting one of the hero’s most memorable arcs from Marvel Comics. Daredevil’s third season picks up immediately after the events of The Defenders’ superhero team-up and finds a badly beaten and bloodied Matt Murdock (Charlie Cox) in the church orphanage where he was raised. There, a pair of important figures from his past quickly learn about his double life and commit to keeping his secret while nursing him back to health. Matt’s battle against the Hand has robbed him of everything: his life, his friends, his abilities, and most important of all, his sense of self. Matt is a man unmoored because, in spite of all the objective good he’s done for his city (see: stopping the Hand), he was unable to fully shield those he loves from the dangers of the shadowy worlds he walks through. At first, the gravity of what Matt sees as his personal failings pulls him down into the depths of existential doubt and self-loathing, which brings out his more self-destructive impulses. The orphanage makes for an ideal setting for Matt to wallow in his despair as he emotionally flagellates himself. He’s resigned to the idea that his inner turmoil is a well-deserved punishment from a God he no longer has the best relationship with. Thankfully, Matt isn’t really afforded too much time to enjoy his pity party because of Sister Maggie (Joanne Whalley), a dry, worldly nun who had a hand in raising Matt as a child. Matt’s being Daredevil doesn’t exactly shock Maggie all that much because, from her perspective, that path in life is a natural outgrowth of his attempts at processing the various traumas he’s experienced. Understanding though she is, Maggie refuses to let Matt stew for too long, understanding that he still has important work to do, both for himself and for the world around him. Maggie kicking Matt into gear in Daredevil’s first two episodes is actually the perfect encapsulation of the season’s overall pacing. Unlike virtually every other Netflix MCU to date, Daredevil’s third season moves with the kind of briskness that audiences have been wanting for ages. It’s not long before Matt’s back up on his feet and becoming entangled in yet another complicated web of lies, deceit, and destruction crafted by one of his most formidable foes—one Wilson Fisk (Vincent D’Onofrio). Much in the same way that Matt’s brokenness pushes him to reflect upon the darkness he feels within himself, Fisk’s incarceration inspires him to reevaluate his position in society and think about what he wants in life. With Fisk, true moral reform is absolutely out of the question. He wants his freedom and revenge and to assert himself as the kind of power player who wields enough influence to be truly considered a kingpin. Fisk is especially compelling this time around as he expands the scope of what’s considered villainy in order to get his way. 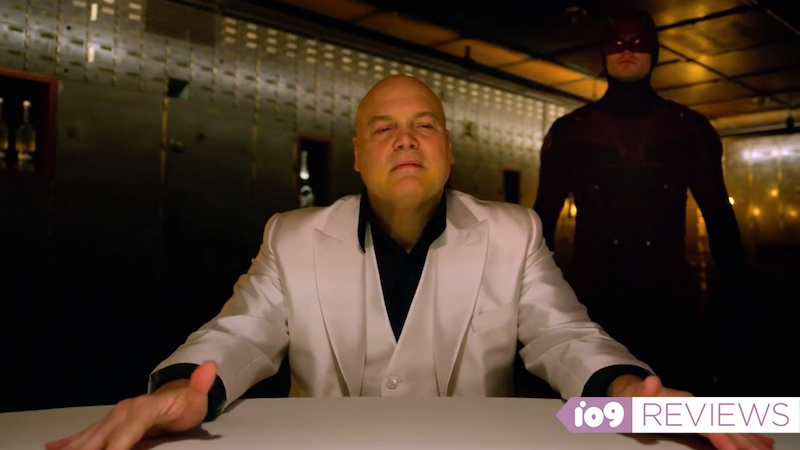 Instead of merely using his connections and money to buy what he wants, he devises a plan designed to play on the public’s perceptions of Daredevil’s identity to destroy what little security Matt and those connected to him have left. With the assistance of Rahul Nadeem (Jay Ali), an FBI agent swimming in debt and in desperate need of a promotion, and the increasingly unhinged agent Benjamin Poindexter (Wilson Bethel), Fisk sets out on the warpath and gradually becomes a version of himself that’s much more aligned with his comics counterpart, white suit and all. Of course, Karen Page (Deborah Ann Woll) and Foggy Nelson (Elden Hanson) return this season as Matt’s beleaguered and imperiled support system, who still want what’s best for their friend despite all of the trouble he’s brought into their lives. Foggy, who’s gradually been able to establish himself as a successful lawyer independent of Matt, is conflicted about just how deeply he wants to become involved in the latest chapter of Matt’s ongoing fight to save New York City from Fisk. Karen’s similarly conflicted, but in time, she willingly throws herself in the fray—more out of a sense of larger justice as opposed to simply wanting to help Matt. This aspect of her story reveals new depths to her character and background this season, and really allows for Woll’s performance to stand out. That said, the entire cast’s performances this season are a delight to watch because regardless of the size of their roles, everyone brings a level of calculated urgency and relatability to the table that makes you understand their character’s motivations. Bethel’s performance as a fledgling Bullseye is a particularly welcome surprise due to the time Daredevil takes to illustrate his descent. Like many of the Netflix MCU villains, this incarnation is a breed of sociopath who seems predestined for crime and nefariousness, but Daredevil digs into Bullseye’s past to reveal the numerous times he struggled with his inner demons in attempts to become a better person. By the time “Dex” steps onto the scene as a fully-formed baddie, your understanding of who he is and what he’s capable of is what makes him terrifying. As much as this season of Daredevil has been spoken about as being concerned with Matt’s crisis of faith, the overarching thesis of the season is so much more expansive than that. Matt’s frayed relationship with God is what pushes him to fully embrace the devil within, something he recognizes as a dark part of himself, much in the same way that Fisk’s circumstances inspire him to accept the “good” part of himself that, while still criminal, acts out of a desire to protect his beloved Vanessa. While the show definitely unpacks the moral gray areas its players exist in, the characters’ conceptualizations of themselves are all very black and white. It creates a fascinating tension between how we as an audience understand the show and how everyone within the show understands their role in the events playing out. Add to that the fact that the show’s cinematography and fighting choreography are once again stellar and it’s difficult to deny that Daredevil’s third season is definitely worth tuning in for when it hits Netflix on October 19.